FACT CHECK: Did Congress Designate Confederate Soldiers as United States Veterans? Congress passed laws in 1929 and 1958 designating all Confederate soldiers as United States veterans, making it illegal to remove monuments to the Confederacy. 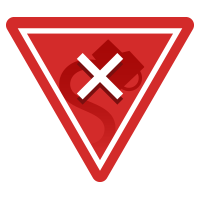 In August 2017, a national debate about the display of Confederate flags and monuments once again gained steam after a protest of the planned removal of a statue of Confederate General Robert E. Lee from a park in Charlottesville, Virginia turned deadly. Confederate soldiers, sailors, and Marines that fought in the Civil war were made U.S. Veterans by an act of Congress in in 1957, U.S. Public Law 85-425, Sec 410, Approved 23 May, 1958. This made all Confederate Army/ Navy/ Marine Veterans equal to U.S. Veterans. Additionally, under U.S. Public Law 810, Approved by the 17th Congress on 26 Feb 1929 the War Department was directed to erect headstones and recognize Confederate grave sites as U.S. War dead grave sites. Just for the record the last Confederate veteran died in 1958. So, in essence, when you remove a Confederate statue, monument or headstone, you are in fact, removing a statue, monument or head stone of a U.S. VETERAN. The same image was previously shared by the same Facebook page in a July 2015, just after a gunman in Charleston, South Carolina, killed nine black churchgoers. 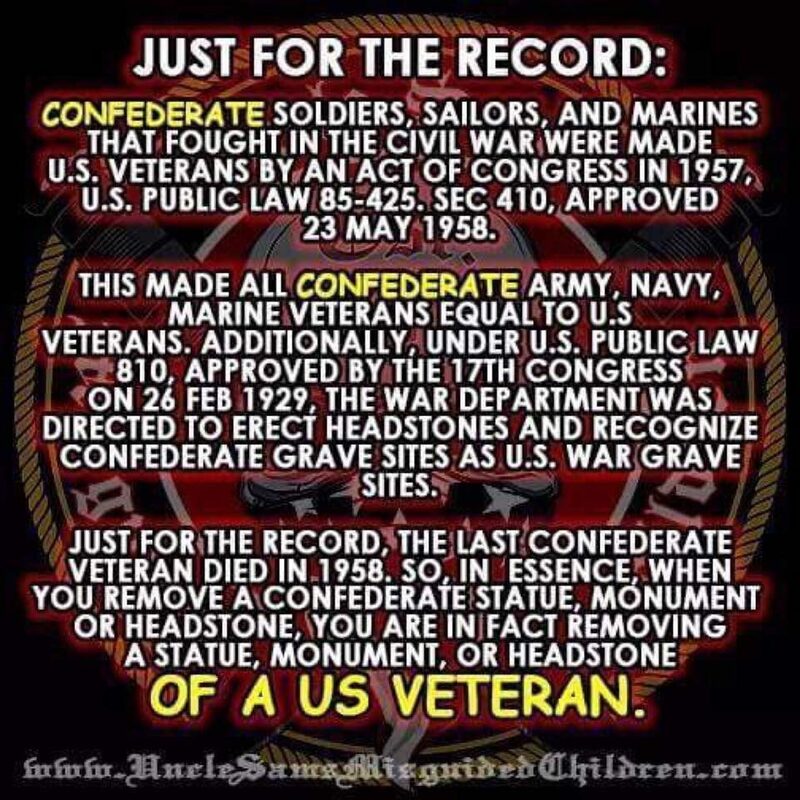 According to the meme, two acts of Congress (Public Law 810 of 1929 and Public Law 85-425 of 1958) bestows upon Confederate soldiers the benefits and status of a United States military veteran. (2) Any individual eligible for burial in a national cemetery (but not buried there), except for those persons or classes of persons enumerated in section 2402(a)(4), (5), and (6) of this title. No portion of the law appears to confer any privilege other than markers for graves of Confederate soldiers, nor does it grant Confederate soldiers status equal to those of veterans of the United States military. As of 1901, 482 individuals (not all soldiers) were already interred in the Confederate section of Arlington National Cemetery. To increase the monthly rates of pension payable to widows and former widows of deceased veterans of the Spanish-American War, Civil War, Indian War, and Mexican War, and provide pensions to widows of veterans who served in the military or naval forces of the Confederate States of America during the Civil War. A National Archives and Records Administration document details the matter of Confederate soldiers and pensions, and shows that the law seems to recognize those who fought for the Confederacy as veterans of a war, but not necessarily of the United States military. The last recorded Confederate soldier deaths were in 1959, meaning that the 1957 law had negligible effects for those under its provisions, and in any event the law again conferred no status or other benefit to Confederate soldiers themselves. [It’s] clear that Public Law 85-425, section 410 of 1958 was intended solely to provide a symbolic, Civil War Centennial gesture late-life pension to Walter Williams, the supposed only surviving Confederate veteran, and did not apply in any way to any other Confederate soldiers. Of course it turned out (as many people knew then) that Williams was not, in fact, a Confederate veteran – but the desire to still have a living link to the War proved more important than fact. I have been no more successful than anyone else in finding the supposed Public Law 810 passed in 1929. But, given my experience with other claims based on legislation introduced or passed in Congress during that era, I would surmise that any such law was symbolic and meant as a gesture. On the other hand, there was the 1906 Foraker Law that began Federal involvement in caring for Confederate graves. You have probably seen this VA publication [PDF] and consulted John Neff’s important work, Honoring the Civil War Dead (University Press of Kansas, 2005) about that issue. Neff makes clear that Federal money spent on maintaining Federal graves always kept the distinctions between the graves — and the service — of Federal versus Confederate soldiers. [There is, however] the decision in the case of Patrick G. Griffin, III vs. Department of Veterans Affairs issued by the US Court of Appeals 4th District … the decision ultimately affirmed the VA’s contention that the Confederate prisoners buried at Point Lookout were buried and honored as American soldiers and, therefore (the issue before the court) there was no obligation to allow Confederate flags to fly over their graves. The Department of War had been content to allow Northern cemeteries where Confederates were interred to languish. However, after the Spanish-American War (1898), the federal government, led by President William McKinley, in the spirit of national reconciliation and in the postwar glow of recent victory, proposed that a loving nation would reach out and care for the graves of fallen Confederates. Recognition of these places as hallowed ground and the individuals interred in them as deserving of honor began with the creation of the Confederate section at Arlington National Cemetery in 1900, and continued with the renewal through 1916 of 1906 legislation that authorized federal funds to mark all Confederate graves. Providing headstones for America’s fallen soldiers is a tradition that goes back to laws passed in 1867 and 1873 that ordered the Department of War to properly establish national cemeteries and furnish graves with headstones … It wasn’t until the 20th century, though, that Confederate veterans were included in this tradition. It started with legislation passed in 1906, at first providing headstones for a very limited number of Confederate veterans, specifically prisoners of war, “who died in Federal prisons and military hospitals in the North and who were buried near their places of confinement.” That mandate for the Department of War was expanded to all Confederate graves with a law passed in 1929. It’s no coincidence that many of these changes in attitude and law, and the erection of so many Confederate monuments and memorials, occurred around the turn of the 20th century. They followed the federal withdrawal from the South in 1877, a strategic retreat from the failed policies of reconstruction. When a debate over Confederate monuments and flags came under the national spotlight in June 2015, codified changes in burials and pensions enacted in 1929 and 1958 were puffed up to suggest that a nebulous act of Congress, either in the 1920s or the 1950s, officially declared that Confederate soldiers were the same as United States veterans in the eyes of the federal government. However, no legislation either explicitly or implicitly granted Confederate soldiers status as United States veterans. Survivors of dead Confederate soldiers often took offense at measures appearing to equate them to Union soldiers, objections that died off as Southerners from the Civil War era did. Correction [25 August 2017]: Due to an editing error, a previous version of this article stated that President Andrew Jackson pardoned Confederate soldiers. Facing South. 24 July 2015. The Atlantic. 19 July 2013.